My name is Yvonne and the support I received from Allyson has been invaluable. In 2010, I lost my mum and I was in a very dark place trying to come to terms with financial hardship and emotional stress. My dad was my rock, and during his illness I became his carer, but he passed away in 2012. Although I have two sisters, they have husbands, and I found myself unbelievable lonely with the added ‘burden’ of being strong for my own children. I found myself questioning just who I was and who would love me now? Some people think because you are mature adult and your parents lived a long life, losing them shouldn’t really affect you so much. I joined Tea and Toast, the local family support group run by Allyson, in 2010 when I lost my mum. The group gave me a safe place to be. I made new friends, my confidence increased, and I began to believe in myself again. In fact, one of the group came with me to collect my mother’s ashes – I was deeply moved that someone I barely knew, should support me at that time of deep loss. After my father passed, Allyson was there at the end of the phone or email. She is always ready to listen to my woes, without judging, and has supported me through what has been a difficult few years. Allyson gave exactly the right support to me through this difficult time and one day I hope to write about my experiences to help others. 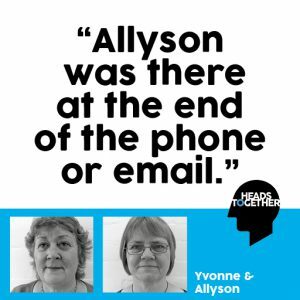 I also hope Allyson’s Tea and Toast will never cease, so many more people like me can be supported in future years.